His Excellency Sir, we have received your request for a change of name, that you no longer wish to be known and called Goodluck Ebele Azikiwe Jonathan, but now wish to be called Obama Otueke, in honour of the first black President of the United States of America and the first village in Africa where a child once walked shoeless but is now the President of the biggest black nation on Earth. 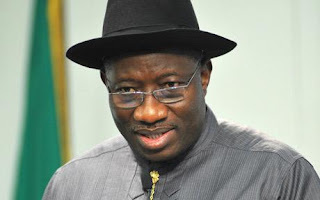 Goodluck Ebele Azikiwe Jonathan, President Federal Republic of Nigeria. Your Excellency, in line with your request on May 29, 2012 we immediately moved to make the requested change. We are writing this mail to intimate you of how we have progressed so far to ensure that all your past records align with your new name. First, we have had to visit your primary school at Oloibiri, St Stephens and St Michael’s primary school which you left in 1969. We are sorry to tell you that the school could not trace your records. They claim that they do not have a very good record system and so it was almost impossible to trace your records and note your name change against it for the sake of future enquiries. The danger of not doing this is that when people make enquiries about you in future, you may not be recognised and this could be a tool in the hands of your political enemies who may say you never attended these schools. We also visited your former Secondary School, Mate Dei High School, Imiringi. We had some luck here; they were able to trace your certificate and marked your new name against it. But you may need to visit this school, they would appreciate some generous donation from an illustrious alumni like you. They, however, advised that you have to contact the West African Examination Council (Waec) to inform them of your name change. This is to ensure that your records with the examination body tallies with your new name. We visited the University of Port Harcourt where you had all your three degrees. They spent some time looking for your transcripts in the records office which was stacked full with files upon files. But they eventually traced all your transcripts and have noted your new name against it. The difficult part of this assignment was in telling your parents about your change of name. We are afraid to say they did not take it kindly. Your Dad threatened to commit suicide if you give up the name that he has brought you up with, the family name that has brought you so much greatness. This is the name, he insists, that has taken you from being shoeless to now having so many shoes. He refused to listen to reason and said that he will rather die than see you answer a new name. Your Mother’s case was quite different. She was just silent as she shook her head repeatedly. All she said as we were leaving was that her enemies will not succeed. We had to break the news to your dear Wife. She did not take kindly to it either. How can you wake up and suddenly dump a name that has brought you so much good luck, she asked. She even said that she is sure that the witches in the opposition party have confused your mind. She raised several issues. What happens to her marriage certificate? What does she tell her friends? How is going to tell them that she is no longer Mrs Goodluck, that she is now Mrs Otueke? Assuming she loses all the good luck that has come to her since she married Mr Goodluck, she wondered. God Forbid, she said. If there is any change of name, she will assume she is now a widow. She insists that her marriage certificate reads Mrs Goodluck and the contract says “till death do us part.” So any change of name means Goodluck is late and she is now a widow. His Excellency, we are afraid to tell you that we did not make any progress with Her Excellency on this issue. Finally, we had to let INEC and your party into your change of name initiative. INEC simply advised that the name on the ballot paper when you contested was Goodluck Ebele Azikiwe Jonathan and that is the name they recognise. That if you have to change your name, then you may have to contest a new election based on your new name. Simply, you have to resign now and handover to the Vice President and contest the next election based on your new name. They insist that they have it on good record that a lot of Nigerians voted for you based on the Goodluck in your name. Without it, you would not have won the election, they insist. We advise that you may have to challenge their decision at the Supreme Court. The position of your party was not that much different from that of INEC. They also insist that what sold you to them was the Goodluck in your name, that your new name cannot win an election. They would therefore be reluctant to field you in the next election if you chose to go ahead with your new name. Your Excellency, so this is how far we have gone with the request for change of name. We are yet to contact all Nigerian embassies abroad, all other country embassies, all other foreign head of states and all international bodies like the UN, African Union, ECOWAS and all others that have known you by your old name of your decision to change your name. They will also have to effect changes in their records to that effect. Your Excellency, changing your name at the age of 55 is not an easy task to accomplish. Considering all you have achieved in such a short life. We have attached a detailed budget of the financial implication of this name change. However, we kindly advise that dealing with the human implication is beyond our capacity. So we advise that you talk with your wife, parents, children, friends, INEC and your party. Hopefully, you will be able to convince them about your intention.